Lemon Chicken Bento, a photo by sherimiya ♥ on Flickr. Oh my goodness... can it be a bento that doesn't include a ... thermal?? Yeah, I'm kind of getting over the thermal thing right now. It's actually a lot more satisfying to arrange a traditional bento box for a change. Plus, I made lemon chicken, which goes so nicely with some rice and vegetablian accents. 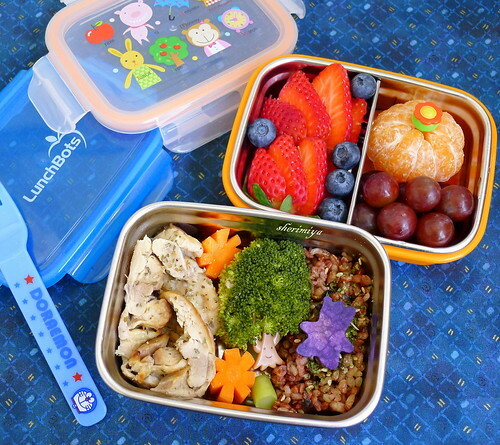 I used a LunchBots Clicks for the larger box -- it's slightly deeper and is practical for the main protein and stuff -- and along with the chicken and rice I added the usual broccoli tree, carrots and bear-shaped Okinawan sweet potato. I used a very similar box for the sides, and even though LunchBots does make the smaller Clicks for this purpose, the one I used here has the advantage of the removable, adjustable divider -- so fun and handy! Maybe LunchBots can come up with something like this? Hmmm? I didn't really need to separate the strawberries and blueberries from the satsuma and grapes, but well, why not! Heh. I think the lemon chicken wasn't as great a hit as I'd hoped. I think my kids are just way too stuck on shoyu chicken. I haven't tried a rosemary or other herb chicken though. Maybe I'll give something like that a try next. Anyway, the adults like lemon chicken because of the tart sour nature but my kids immediately blurted out "Is there lemon in here or something?!" Place the chicken pieces skin side down on a rimmed baking sheet and salt them lightly. Broil for 15 minutes. Turn the pieces, lightly salt them, and broil them until the skin is crisp and golden brown and the juices run clear when the pieces are pierced with a fork, 15 to 20 minutes longer. Remove the chicken from the broiler, leaving the broiler on. Cut the breast and thighs in half, if necessary. Pour off all but 1 tablespoon of fat. Broil the chicken until it has browned a bit more, another 2 minutes, then turn the pieces skin side up and broil them until the skin is browned a bit more, about 3 minutes longer. Remove the chicken from the baking sheet, and if you’re using parsley, stir it in the sauce still in the baking sheet. Pour the sauce over the chicken and serve. Fruit part is my fav, but the whole bento looks very yummy. Thank you Upajam się Japonią ~! Heather said it so well! I love the many variations possible in bento, going through "phases" then opting for a new approach--endlessly fun! So true when you look at it that way; it sounds creative and enjoyable. Thanks Bentobird! This looks so colorful and nice. Who wouldn't love to eat them. I'm so glad to have found your blog. So delightful and so inspiring! Luckily my little girl LOVES lemon, so i'll try this on her tonight.